Before you decide to add a recessed light, also known as a can light, or decide which recessed or can light to install, there are a few things to consider: What do you want to light? Do you want a pool of light or a tight spot? What size fixture do you want? What kind of light bulb do you want to use? Do you need to use a remodel fixture, or can you install a new-construction housing? What about getting the necessary wiring to your new light? Will you need an IC (Insulation Compatible) or AT (Air Tight) fixture or one that is both? Housing: Some recessed fixtures are all one piece, but most are made as two pieces. In a two-piece fixture, the housing is the piece that is mounted to the ceiling. Trim is inserted into the housing. Depending on the type of housing and trim you choose, you may have to remove the trim to install the light bulb. Wattage: Every electric lighting fixture is rated for the maximum wattage of the incandescent light bulb or bulbs that you can safely use in it. 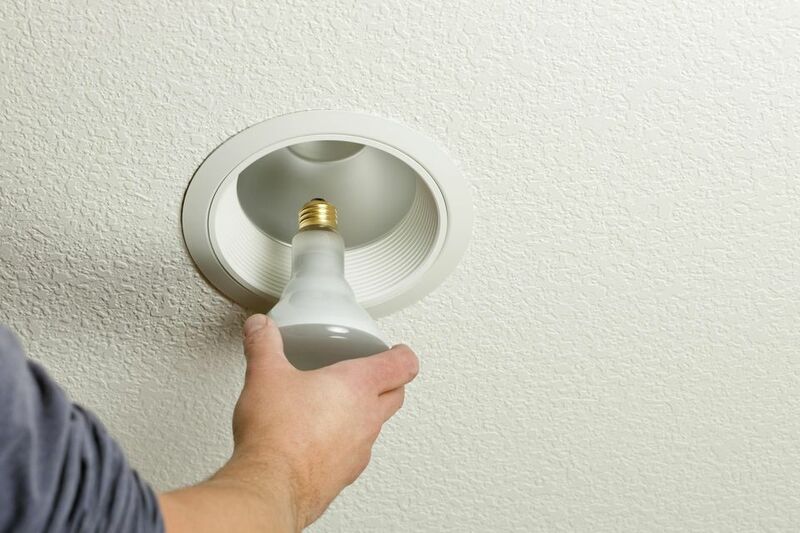 Most recessed fixtures are rated for 75 or 100-watt bulbs, but some are rated for bulbs up to 150 watts. Frame: Recessed fixtures that are made for installing into open framing have a mounting frame that is attached to the framing members in your ceiling—the joists—to secure them in place. What Do You Want to Light? Recessed light fixtures are very versatile. They can be used to provide general lighting, task lighting or accent lighting. If you want more light to read by, or on your kitchen counter, you probably want a downlight. The same is true for lighting a hallway or corridor, or for the general lighting in a large room such as your family room. To light up that sculpture on your mantel, you'll probably want an eyeball spot. On the other hand, to highlight a large painting or poster, or to subtly light your stereo components, a wall washer trim may be what you need. What Size Fixture Do You Want? The common sizes for residential recessed light fixtures are 4" through 7" in diameter. One way to answer this question is by considering how far the ceiling is from where you want the light, and how big an area you want to light. In an 8' ceiling, a 4" fixture can work well to provide kitchen countertop lighting. A 6" downlight at that height will illuminate your breakfast table nicely. In a 10' ceiling, you might want 4" fixtures for area lighting, since the light will spread out more. A 7" fixture makes a nice wall washer in an 8' ceiling. The most popular size is a 6" fixture. For that reason, there are more different styles of trim available for 6" fixtures than the other sizes, giving you greater flexibility in choosing the trim you want. What Kind of Light Bulb Do You Want to Use? A recessed fixture with a medium screw base lamp holder can take an incandescent, fluorescent, halogen or LED light bulb. There are also fixtures available with special lamp holders, or sockets, that can only take certain light bulbs, usually fluorescent or halogen. If you like the savings, long life and temperature coolness of fluorescent lamps, but you also like the color warmth of the incandescent light, you can buy fluorescent lamps with a high Kelvin value. For high-intensity light, especially in a small area, halogen often works best. For warm, general lighting, most people prefer incandescent lamps. LED light bulbs can combine several of these characteristics. If you want to be able to dim your recessed lights, or control them with a remote or automated system, choose fixtures you can use incandescent, halogen or LED light bulbs in. Fluorescent light bulbs are not dimmable unless they have a dimmable ballast. Recessed lights are made with two different means of support. The housing for a remodel fixture is typically supported by pushing metal clips through the housing onto the top of the ceiling—the drywall or plaster. New-construction fixtures are supported by screwing or nailing the fixture's frame to the ceiling joists. If you can't get above the ceiling to run the wiring, you will probably have to use a remodel fixture. But if you have access to space above the ceiling where the fixture will be located, you can install new-construction recessed lights in your existing ceiling. The pluses of doing this include that new-construction fixtures are usually less expensive and have a larger selection of trims than remodel fixtures do. Remember to bore a hole in the center of each joist if you need to feed wire from one joist bay to another. Remember, also, that the connections for recessed lights are made in a junction box attached to the fixture. If you are using Type NM (Romex) wiring, look for fixtures that have built-in Type NM clamps in their junction boxes. If you are using Type MC cable, get fixtures that have that clamp built in. It will save you an incredible amount of time. Do You Need an Insulation Compatible or Air Tight Fixture? Many recessed lighting fixtures are made to be Insulation Compatible (IC). That means the housing can be installed in direct contact with insulation. If you're planning to add recessed lights in an insulated ceiling, you should only buy fixtures with housings that are IC rated. Otherwise, you will have to buy or build a cover to keep the insulation away from them. If a recessed lighting fixture isn't rated to be Air Tight (AT), installing it creates a chimney for your wintertime heating to escape through. This may not be an issue if there's more of your living space above it, but it's very important if that space is your unfinished attic. Any recessed lighting fixture that will be housed in an unfinished, insulated attic needs to be both IC and AT rated. The good news is that most styles of recessed fixtures are available with either or both ratings. Will You Need a New or Upgraded Lighting Circuit?